Berneri: "Kropotkin His Federalist Ideas"
First published in 1922 under the title "Un federalista Russo Pietro Kropotkine". First English translation published in "War Commentary", May 1942. Reprinted in July 1942 and February 1943. This is from my copy of the Freedom Press pamphlet version which originally sold for 2d. ONE of the most interesting aspects of Kropotkin's political thought is the federalist idea which constantly recurs in his writings and forms one of the basic factors in his anarchist ideology. Although Kropotkin's federalism is not a systematic theory and cannot be very clearly differentiated from that of Proudhon or Bakunin, it nevertheless presents various characteristics which make its study of interest. For such a study a biographical excursus is needed in order to illuminate for us the beginnings of Kropotkin's federalist thought in relation to the surroundings in which it formed itself and developed. Tilgher, writing about Kropotkin rightly remarks: "It is impossible to understand the intimate spirit of the anarchist movement if one does not consider it historically as a radical and violent reaction against the profound transformation undergone during the nineteenth century by the institution of the State." Kropotkin, the anarchist-prince, provides the best example of this assertion. Kropotkin's clear and detailed biography enables us to follow the different phases in the development of his federalist thought step by step. At the age of nineteen, when he was an officer of the Cossacks, he went to Transbaikalia where he took a passionate interest in the great reforms undertaken by the government in 1862, and carried out by the Higher Administration of Siberia. As secretary to government committees he was in touch with the best of the civil servants and began to study the various projects of local government administration. But he very soon saw that the reforms proposed by the District Chiefs and protected by the Governors General, were submitted to the orders and influence of the central government. Administrative life revealed to him every day absurdities in system and method. Seeing the impossibility of achieving any kind of reforms, he took part in 1863 in an expedition along the Amur. During a storm forty barges were sunk with the loss of 2,000 tons of flour. This catastrophe gave him an opportunity of getting to know the bureaucratic system still better. The authorities refused to believe in the disaster, while the civil servants concerned with Siberian affairs in Petrograd revealed a complete ignorance of all that concerned their particular specialty. A high functionary said to him: "But my dear fellow, how would it be possible for 40 barges to be destroyed on the Neva without someone jumping in to save them!" When Kropotkin replied that the Amur is four times as big as the Neva, the astonished functionary asked: " But is it really as big as all that?" - and passed on, annoyed, to talk of some frivolity. Kropotkin went to Manchuria more than ever distrustful of the central government. He probably thought of the Petrograd bureaucrats when at the Chinese frontier an official of the Celestial Empire refused his passport because it was only composed of a modest sheet of stamped paper, but showed the greatest respect for an old copy of the bulky Moscow gazette which was shown to him as a passport. As an attache of the "Governor General for Cossack affairs," Kropotkin made an accurate inquiry into the economic conditions of the Coasacks of the Usuri. On his return to Petrograd he was congratulated, promoted, and got special rewards. But his proposals were not put into practice because of the officials who stole money and continued to flog the peasants, instead of furnishing them with cattle and, by prompt and suitable assistance, relieving the effects of famine. "And thus it went on in all directions, beginning with the winter palace at St. Petersburg and ending with the Usuri and Kamchátka The higher administration of Siberia was influenced by excellent intentions, and I can only repeat that, everything considered, it was far better, far more enlightened, and far more interested in the welfare of the people than the administration of any other province in Russia. But it was an administration--a branch of the tree which had its roots at St. Petersburg--and that was enough to paralyze all its excellent intentions, enough to make it interfere with and kill all the beginnings of local life and progress. Whatever was started for the good of the country by local men was looked at with distrust, and was immediately paralyzed by hosts of difficulties which came, not so much from the bad intentions of the administrators, but simply from the fact that these officials belonged to a pyramidal, centralized administration. The very fact of their belonging to a government which radiated from a distant capital caused them to look upon everything from the point of view of functionaries of the government, who think first of all about what their superiors will say, and how this or that will appear in the administrative machinery. The interests of the country are a secondary matter. Parallel with his knowledge of the inefficiency of the central administration bodies. his observations on the free association of those engaged in common interests which he made throughout his long journeys in Siberia and Manchuria also contributed to the formation of his anarchist personality. He saw clearly the role played by the anonymous masses in great historic events and in the development of civilization. This realization, as we shall see later, influenced the whole of his sociological criticism, and was fundamental to his method of historical research. It is necessary to add that the militants of the Jura Federation were imbued with the anarchism of Bakunin which was essentially federalist. Kropotkin, as he himself states, was never in direct contact with Bakunin. On his return to Russia, he got in touch with the groups of left-wing intellectuals, and he realized anew the uselessness of the attempts made by those who tried to regenerate the country through the zemstvos. Such work was suspected of being separatist, of trying to form a State within the State, and was persecuted to such a point that any attempt to improve the rural administration with regard to health services or schools was a miserable failure, and carried with it the ruin of entire groups of members elected to the zemstvos. Notwithstanding the disappointments attendant on his administrative experience, before he left Russia, Kropotkin set to work once more. Having inherited his father's property at Tambov, he went to live there and devoted all his energies to the local zemstvo. But he was compelled once more to realize the impossibility of setting up schools, co-operatives, or model factories without creating new victims of the central government. From the articles that Kropotkin published between 1879 and 1882 in the Révolté of Geneva, it seems clear that the administrative system of the West only provided him with new material for his criticisms against the State, and confirmed him still further in his federalist and libertarian ideas. Wherever centralism existed he found a powerful bureaucracy. Centralism, resulting in excessive bureaucracy, appeared to Kropotkin as one of the characteristics of the representative system. He saw in the parliamentary regime the triumph of incompetence, and he described with picturesque irony the administrative and legislative activities of the M.P. who is not called upon to judge and deal with matters for which he is specially fitted, but is asked to vote on a series of questions, of an infinite variety, arising from those elephantine machines that are the centralized State. "He will have to vote taxes on dogs and the reform of university education, without ever having set foot in a university or ever knowing a country dog. He will have to give his opinion on the advantages of the Gras rifle and on the site for the State stables. He will have to vote on the phylloxera on grain, tobacco, primary education and urban sanitation; on Cochin, China and Guiana, on chimneys and the Paris Observatory. He has never seen soldiers except on maneuvers, but he will dispose army corps; never having met an Arab, he will make and re-make the Mussulman legal code in Algeria. He will vote for the shako or the kepi according to the tastes of his wife. He will protect auger and sacrifice grain. Will destroy the vine under the impression that he is protecting it. Will vote for afforestation against pasturage, and protect pasturage against the forest. He will have to show his ability in banking. He will sacrifice a canal or a railway without knowing in what part of France they are situated. He will add new articles to the legal code without ever consulting it. A veritable Proteus, omniscient and omnipotent, to-day a soldier and to-morrow a pig-man, successively a banker, an academician, a street-sweeper, doctor, astronomer, drug-manufacturer, tanner, or contractor according to the orders of the day in Parliament, he never knows a moment's hesitation. Accustomed in his capacity as lawyer, journalist or public orator, to speak of things he knows nothing of, he votes for all these and other questions as well with only this difference; while in the newspapers he merely amused with his gossip, and in the court room his voice only awoke the sleeping judges, in Parliament he will make laws for thirty or forty million inhabitants." P Kropotkin, Paroles d'un revolté. But the western countries, together with the ridiculous administrations of the centralized parliamentary regimes, revealed to him the immense strength, vaster and more complex, observed in the Russian Mir: that or the free associations which "extend themselves and cover every branch of human activity," and which made him declare that "the future is in the hands of free associations and not of centralized governments." Especially the years spent in England, a country where the independence of the people and the enormous development of free initiative could not fail to strike the foreigner coming from Slav or Latin countries, made Kropotkin attach great, sometimes even excessive, importance to associations. From his direct knowledge of the Western world, Kropotkin added a new tendency in his studies. A geographer in Russia, he became an ardent historian in Britain. He wished to understand the State and knew that in order to do so "there is only one way; that of studying it in its historic development." He discovered with enthusiasm that the general tendency of science is that "of studying nature not from its large results and great conclusions, but rather through single phenomena, through separate elements." History also ceases to be the history of dynasties, and becomes the history of peoples. So much the better for historical method, but also for the federalist conception, for it will become obvious that great progressive changes have not taken place in courts and parliaments, but in the city, in the countryside. Devoting himself to historical studies, Kropotkin saw in the excessive centralization of the Roman Empire the cause of its collapse, and in the epoch of the Communes the renaissance of the western world. "It is in the enfranchisement of the Communes and in the uprisings of the people and the Communes against the State, that we find the most beautiful pages of history. When we look at the past, it is not to Louis XI, or Louis XIV or to Catherine II that we turn our eyes, but rather to the Communes or the Republics of Amalfi and Florence, of Toulouse and Laon, Liége or Courtrai, Augsburg and Nuremburg, Pskov and Novgorod. Another historical field explored by Kropotkin was the French Revolution. He was opposed to the bourgeoisie of 1789 whose "ideal was to abolish all the local powers which at that time constituted so many autonomous units in the state. They meant to concentrate all governmental power in the hands of a central executive authority, strictly controlled by Parliament, but also strictly obeyed in the State, and combining every department -- taxes, law courts, police, army, schools, civic control, general direction of commerce and industry everything." ("The Great French Revolution") He reproached the Girondins for the attempt to dissolve the communes and demonstrated that their federalism was merely an opposition slogan, and that in their actions they showed themselves to be as much in favor of centralization as the Montagnards. According to Kropotkin the communes were the soul of the French Revolution and he gave extensive illustrations of the communalist movement, seeking to show that one of the prime causes of the decadence of the cities was the abolition of the plenary assemblies of citizens which held control of Justice and the Administration. The epoch of the Communes and of the French Revolution were for Kropotkin, as for Salvemini, the two historical fields in which he found the confirmation of his own federalist ideas and the elements of the development of his libertarian conception of life and politics. But there always remained alive in him the record of his observations on the Russian mir and of the free associations among primitive peoples, and these recollections confirmed in him his federalism, which sometimes makes him turn to a popular naivete as in the Conquest of Bread. When he studied the various socialist theories, Kropotkin adopted a negative attitude towards the Saint-Simonians and the so-called Utopians, in particular Cabet, because they founded their systems on an administrative hierarchy; but he showed on the contrary great enthusiasm for the communalist theories of Fourier (see "Modern Science and Anarchism"). He opposed State collectivization because although it decidedly modified the capitalist regime "it does not abolish the wage system," because "the State, that is to say the representative government, national or communal, puts itself in the place of the boss," so that its representatives and bureaucrats absorb, and render necessary, the surplus value of production. (See "Conquest of Bread" and "Modern Science and Anarchism") Also true of the socialist State is the following remark: "How much work do we yield to the State? No economist has ever tried to work out the number of work-days that the worker in field or factory gives every year to this Babylonian idol. It is in vain that one searches through books of political economy in order to arrive at an approximate estimate of what man, the producer of all wealth, gives to his labor to the State. "A simple estimate based on the State budget, of a nation, of the provinces and communes (which contribute to the expenses of the State) would have no significance because one would have to work out not what goes every year into the Treasury coffers, but what every shilling paid to the Treasury represents in real value by the taxpayer. All we can say is that the amount of work given every year by the producer to the State must be enormous. It must reach, and for certain classes exceed, the three days work a week that the serf used to give his lord." ("Modern Science and Anarchism") Even the socialist State would try to increase its exactions because "every party in power is obliged to create new jobs for its supporters" and it not only would burden the economic life of the country with administrative expenses, but also set up an oligarchy of incompetents. "What is needed, on the contrary, is the collective spirit of the masses acting on concrete affairs." The collective spirit, is a generic term which in the Conquest of Bread became "the people," "the commune," "society" etc., which administers justice, organized everything, and resolves the most complex problems. It is a kind of divinity which Saverio Merlino described with just irony as playing the part of the chorus in Greek tragedy, and which the most profound anarchist theoreticians are far from adoring. But if Kropotkin's federalism lacks precision and puts excessive faith in the political capacities of the people, it is nevertheless remarkable for its breadth of view. No federation can be consistent if it is not integral. And it can only be such if it is socialist and revolutionary. 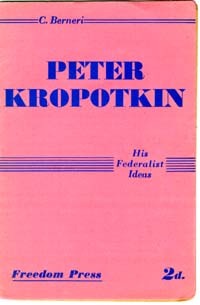 The integral nature of Kropotkin's federalist ideas is proved by many passages in his writings. The following declarations are the most explicit ones; "Federation and Autonomy are not enough. They are only words which cover the authority of the centralized state." "To-day, the State has succeeded in controlling every aspect of our lives. From the cradle to the grave it holds us in its grip. Sometimes under the guise of the centralized state, sometimes as a provincial or cantonal government, sometimes as a State-Commune, it follows our every step, appears at the street corner, holding and tormenting us." The free commune is, according to Kropotkin, the "political form which the social revolution should take." He exalts the Paris Commune because its communal independence was a means, and the social revolution the aim. The Commune of the twentieth century" will not only be communalist, but communist! revolutionary in politics, it will also be so in the field of production and exchange. Either the Commune will be absolutely "free to give itself the institutions it desires and to make all the reforms and revolutions it finds necessary," or else "it will remain merely a branch of the state, hampered in all its actions, always on the verge of coming into conflict with the state, and certain to be defeated in its struggle with it." For Kropotkin, then, the free communes were the necessary channels through which the revolution could reach its maximum development. His federalism aspires to "the complete independence of the Communes, the Federation of free communes and the social revolution in the communes, that is to say the formation of associated productive groups in place of the state organization." Kropotkin said to the peasants: "At one time, the land belonged to the Communes, composed of those who themselves cultivated the land, with their own hands," but thanks to fraud, molestation, and violence, the communal lands have become private property, The peasants must therefore organize themselves in communes and take back this land in order to put it at the disposal of those who are willing to work it." And again, "Do you need a road? Then the inhabitants of the neighboring communes will reach an agreement between themselves and will make one better than the Minister of Public Works. Do you need a railway? The Communes concerned in a whole region will make one better than the contractors who pile up millions building bad railways. You will need schools? You can make them yourselves as well as these Paris gentlemen and make them better than they. The State has nothing to do with all this; schools, roads, canals could be built better by yourselves and at less expense." These passages from "Paroles d'un revolté" make it clear that in those places in the "Conquest of Bread;" where he says that the commune will distribute goods, ration wood, regulate the pasture land, divide the land, etc., he does not mean the Commune as a "branch of the State," but the free association of the members concerned, which may be either a co-operative, or a corporate body, or simply a provisional union of several people united by a common need. Kropotkin, although he realizes the seriousness of them is not too much concerned with the dangers inherent in the autonomy of small groups. There is a characteristic passage on the subject: "Even in our time parochial feelings may give rise to much jealousy between two neighboring communes, present their direct alliance, and even give rise to struggles. But even if these jealousies can effectively prevent direct federation between two neighboring communes, it is by means of the great centers that this federation will stabilize itself. Today, two very small neighboring boroughs have nothing which unites them directly; the few relations they have between themselves will serve more likely to cause conflict than to draw closer the bonds of solidarity. But both of them have already a common center with which they are in constant touch and without which they could not exist; in spite of all parochial jealousies they will be constrained towards union by means of the great city, where they provision themselves and whither they bring their products; each of them must take part in the same federation in order to maintain their own relations with this center of co-ordination, and unite themselves within it." Here again we have a simplification of the federalist problem. But in order to judge Kropotkin fairly one must take account not only of what he has written but also of what he has been unable to write. Some hasty statements, some lacunae, some over amplification of complex problems are not due only to his habit of mind, but also to the material impossibility of developing his point of view. Kropotkin almost always wrote for newspapers intended to be read by workers. Being profoundly democratic he always voluntarily renounced the mantle of doctrinaire in order to roll up his shirt sleeves. Malstesta, who was also an original theoretician and a cultivated man, did the same. Even his pamphlets do not represent the whole expression of his ideas, a complete exposition of his researches. He himslef explains the reason in his "Memoirs": "I had to elaborate a completely new style for these pamphlets. I confess that I often regarded with envy those writers who had as many pages as they liked at their disposal for the development of their ideas, and those who could use Talleyrand's excuse, 'I had no time to be brief.' When I had to condense the work of several months, for example, on the origin of law, for a penny pamphlet, I needed quite a lot of time for abbreviation." Kropotkin met with those material difficulties only towards 1884; afterwards for almost thirty years he was able to write considerable books. But in this second period he was more a theoretician than an agitator, and his thoughts were more occupied with historical researches and scientific studies, so that "Les Paroles d'un Revolte" remains his best anarchist work for freshness of expression and ideological coherence. Some have thought to see in kropotkin's attitude in 1914 an analogy with that of Bakunin in 1871, Bakunin was in favour of the revolutionary defence of France after the Paris revolution had overthrown the monarchy; and he was also opposed to the republican government of Paris and urged insurrection against it in order to oppose the German army only with the revolution of the people. With his pro-war attitude Kropotkin separated himself from anarchism, and he even went so far as to sign the Manifesto of the Sixteen in 1916, a document which marks the culmination of incoherence in the pro-war anarchists; he also supported Kerensky in Russia on the question of prosecuting the war. Kropotkin saw the federalist problem as a technical one and he declares in his last book Modern Science and Anarchism that man will be compelled to find new forms of organisation for the social functions which the State fulfils through the bureaucracy and that "as long as this is not done nothing will be done." But in his life, partly adventurous, partly strictly scientific, he was not able systematically to develop his federalist conception, and his own conception of anarchism in which the vital spirit of the people constitutes the essence of evolution, was opposed to the development of his federalist ideas for the future. What was Kropotkin's attitude towards the European war and the Russian revolution? I think it is interesting to consider it because his federalist thought contributed in forming his attitude. In his Memoirs Kropotkin wrote: "The conflict between the Marxists and the Bakuninsts was not a personal issue. It was the inevitable conflict between the principle of federalism and that of centralization, between the free communes and government by the State, between the free action of the masses of the people advancing towards their emancipation and the legal perfection of existing capitalism--a conflict between the Latin spirit and the German spirit." At the outbreak of the war Kropotkin regarded France as the repository of the Latin spirit that is to say of the revolution and Germany as the triumph of State worship that is to say of reaction. His attitude was that of the "defenders of democracy." At the beginning he joined with the chauvinists of the Entente and fell like Guillaume1 into exaggeration. "For the States of Eastern Europe, and especially for Russia, Germany was the chief support and protection for reaction. Prussian militarism, the mock institution of popular representation offered by the German Reichstag, and the feudal Landtags of the separate portions of the German Empire, and the ill-treatment of the subdued nationalities in Alsace, and especially Prussian Poland, where the Poles were treated as badly as in Russia--without protest from the advanced political parties--these fruits of German Imperialism were the lessons that the modern Germany, the Germany of Bismarck, taught her neighbours, and above all, Russian absolutism. Would absolutism have maintained itself so long in Russia, and would that absolutism ever have dared to ill-treat Poand and Finland as it had treated them, if it could not produce the example of "cultured Germany," and if it were not sure of Germany's protection?" "No one imagines that after the present war, in which all the Russina parties have unanimously risen against the common enemy, it will be possible to return once more to the old autocracy; that is physically impossible. Those who have made a serious study of the revolutionary movement in Russia in 1905 know what were the dominating ideas during the first and second Dumas which were elected under comparatively free conditions. They surely know that home rule for all the sections which make up the Empire was the fundamental policy of all liberal and radical parties. But there is more than that. Finland has achieved her revolution in the shape of a democratic autonomy, and the Duma has endorsed it. Furthermore, those who know Russia and the latest tendencies there, certainly understand that the old autocracy will never be re-established in the pre-1905 form, and that a Russian Consitution will never be able to take on an imperialist form, and assume the spirit which parliamentarism has in Germany. In our opinion, and knowing Russia as we do, we are convinced that Russia will never become aggressive and belicose like Germany. Not only does the whole of Russian history show this, but the way in which the Russian Federation is constituted precludes the development of the militarist spirit in the very near future." For Kropotkin, Russia was the country of the Mir, the country which had offered him a wide field for observation of the results and possibilities of initiative on the part of the people. The European War drew him away from his political family; the anarchist movement. The October Revolution in Russia drew him back to it once more. Kropotkin, even in his earliest writings, fought against the illusion that secret revolutionary societies would be able, once the Tsarist tyranny had been destroyed, to substitute for the defeated bureaucratic machine a new administration made up of honest and intransigeant revolutionaries; "others--the careful ones who work to make a name for themselves whilst the revolutionaries work in the dark or perish in Siberia; others--the intriguers, the demagogues, the lawyers, the men of letters who occasionally shed a soon-dried tear over the tomb of the heroes, and pass for friends of the people--these are the people who will occupy the vacant seats in the government and will cry "Back!" to the nameless ones who have brought about the revolution." Kropotkin's prophecy has been amply borne out in Russia, and our comrade was in the opposition, an opposition which would have had important reprercussions if his unqualified support for the war had not destroyed his political prestige. In an interview with Augustin Souchy published in Erkenntnis Befreiung of Vienna, Kropotkin said: "We should have communal councils. These should work independently. They should for instance see to it that, in the event of a poor harvest, the population did not lack the bare necessities of life. Centralized government is, in this case, an extremely cumbersome machine2 whereas, on the other hand, a federation of the councils would create a vital centre." In his interview with Armando Borghi, Kropotkin placed great stress on the role of the syndicates as the cells of the autonomous and anti-authoritarian social revolution. In some of his letters (23rd December 1920) addressed to the Dutch anarchist De Rejger, which was published in the Vrije Socialist, Kropotkin wrote: "The Social Revolution in Russia has unfortunately assumed a centralized and authoritarian character." Kropotkin's views on the Russian Revolution are expressed in his message to the Western Workers, handed to Miss Bonfield on 10th June, 1920, when she and other delegates of the Labour Party came to greet him in his retreat at Dimitrov. This message is a notable document in the history of the Russian Revolution. Kropotkin pointed out that if one admitted that the attempt to establish a new society through the Dictatorship of the Proletariat is doomed to failure, one cannot nevertheless deny that the revolution introduced new conceptions into Russian life on the social function and on the rights of the worker, as well as on the duties of the individual citizen, and he expressed his idea with a clear but intransigeant criticism of Bolshevism as a party dictatorship and centralized government. "A re-establishment of relations between the American and European nations and Russia must not mean an admission of the superiority of the Russian nation over the nations of which the Empire of the Russian Tsar was composed. Imperial Russia is dead and will never be revived. The future of the various provinces which composed the Empire will be directed towards a large federation. The natural territories of the different sections of the federation are in no wise distinct from those with which we are familiar in the history of Russia, of its ethnography and economic life. All the attempts to bring together the constituent parts of the Russia Empire, such as Finland, the Baltic provinces, Lituania, Ukraine, Georgia, Armenia, Siberia and others, under a central authroity are doomed to certain failure. The future of what was the Russian Empire is directed towards a fedration of independent units. Consequently it would be in the interests of all the western nations that they should declare first of all their recognition of the right of each portion of the former Russian Empire to govern itself." But Kropotkin's federalism goes beyond this proposal for ethnographic autonomy. He points out the necessity to anticipate, in a not distant future, "a time when each component of the federation will itself be a federation, a free federation of rural communes and free cities, and I believe too that Western Europe will also move in this direction." And then follows an outline of the revolutionary tactics of the autonomous federalists and a criticism of the centralized state-worship of the Bolsheviks: "The Russian Revolution--the continuation of the two great English and French revolutions--is struggling to progress beyond the point where the French Revolution stopped when it had reached the idea of real equality, that is to say, of economic equality. Unfortunately this attepmt has been made in Russia under the highly centralized dictatorship of the Bolshevik Party. The same attempt had been made by Baboeuf and his followers, a centralized and Jacobin attempt. I must frankly confess that, as I see it, this attempt to build a communist republic on a highly centralized state foundation, under the stringent laws of a party, is proving itself a colossal failure. The Russian experiment teaches us how communism should not be imposed, even on a people who are tired of the old regime and impotent to offer active resistance to the experiment of the new rulers. The idea of the Soviets, or of the workers' and peasants' councils, already foreshadowed during the revolutionary experiment of 1905 and completely achieved in February 1917, was a wonderful idea. The very fact that these councils must control the political and economic life of the country assumes that they must be composed of all who personally take part in the production of the national wealth. But so long as a country is submitted to the dictatorship of the party, the councils of workers and peasants must obviously lose all meaning. Their role is reduced to the passive one, represented in the past by the States-General or the parliaments, convoked by the monarch and obliged to keep up with an all-powerful Royal Council. A workers' council cannot be a free and effective consultative body when it lacks freedom of the press, a situation existing in Russia for the past two years, on the grounds that a state of war exists. And when elections are held under the autocratic pressure of a party, the workers' and peasants'councils lose their representative strength. Attempts are made to justify this state of affairs by saying that in order to combat the old regime dictatorial law is necessary. But it constitutes a retrogressive step when it concerns the bulding up of a new society on a new economic basis. It is equivalent to the death sentence on reconstruction. The methods used to overthrow, and take over from a Government which is already weak, is known from ancient and modern history. But when it is required to reconstruct on new conceptions of life, particularly in regard to production and exchange of commodities, without having any previous examples as a guide; when each problem must be solved in a short time, then an all-powerful and highly centralized government which deals with every small detail will itself be absolutely incapable of doing this through its functionaries. However numerous they may be, they become an obstacle. The outcome is a vast bureaucratic machine compared with which the French system which requires the intervention of forty functionaries to sell a tree which has been blown down in the roadway in a gale, pales into insignificance. Ad you, workers of the west, can and must avoid this happening with all the means at your disposal, since all of you mst be concerned with the success of the social revolution. The enormous reconstruction work needed in a social revolution cannot be achieved by a central government, even if as a guide in this work it had something more substantial than a few socialist and anarchist pamphelts. What is needed is that the mass of local forces should have the knowledge, the intelligence, the will to co-operate which alone can overcome the difficultites arising from the various local problems. To set aside co-operation and to trust instead to the genius of party dicators is synonymous with destroying the independent groups such as the syndicates called professional unions in Russia, and the local consumers' co-operatives and transforming them into bureaucratic organs of the party as is happening at the present time. This is not the way to achieve the revolution, but the way to render its achievement impossible. For this reason I consider it my duty to advise you never to adopt such a line of action." These are the opinions of Kropotkin on the Russian Revolution, and the basis of all his propaganda. And these are the ideas which animated and still inspire the Anarchist opposition in Russia. The aged Kropotkin, sick and destitute, died during a period of inactivity after having attempted to set in motion a federalist movement but without being able to achieve anything on account of his lack of liberty and because his unqualified support of the world war had destroyed all his political prestige. But the federalist problem both in the field of nationalities and in that of poltical and economic organization is the vital problem in Russia. When experience and the opposition have led th Russian communists definitely away from their doctrinaire schemes and the union of the Russian organisations take the first steps on the road to the new revolution, the personality of Peter Kropotkin will rise to its full height and his thought will inspire the new reconstruction. In Kropotkin's Federalism there is excessive optimism, there are simplifications and contradictions, but there is also a great truth: that freedom is a condition of life and development for all people: that only where a people governs iteself and for itself is it safe from the scourge of tyranny and certain of its progress. 1 Author of the unfortunate pamphlet Karl Marx Pangermaniste. 2Kropotkin expressed his own hostility towards the coercive economy of the Bolshevik government in an interview with the Daily News correspondent, W. Meakin. See also the interesting interviews with Alexander Berkman, in the Libertaire of 22nd February 1922.